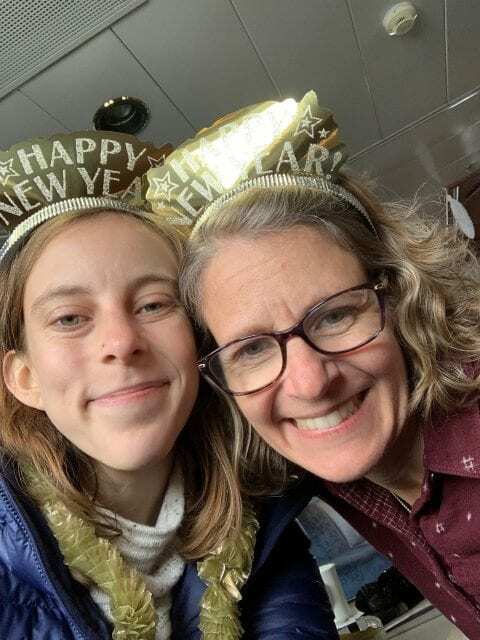 Posted January 19, 2019 by Meredith Davis & filed under Travel. 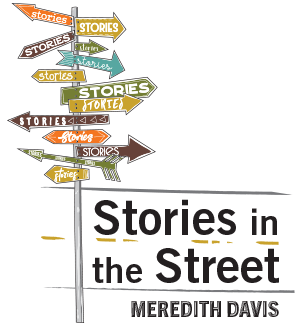 You’ll notice a different look to this blog, which has been incorporated into my new website in anticipation of the publication of HER OWN TWO FEET on October 1, 2019. It’s the same place-just remodeled. 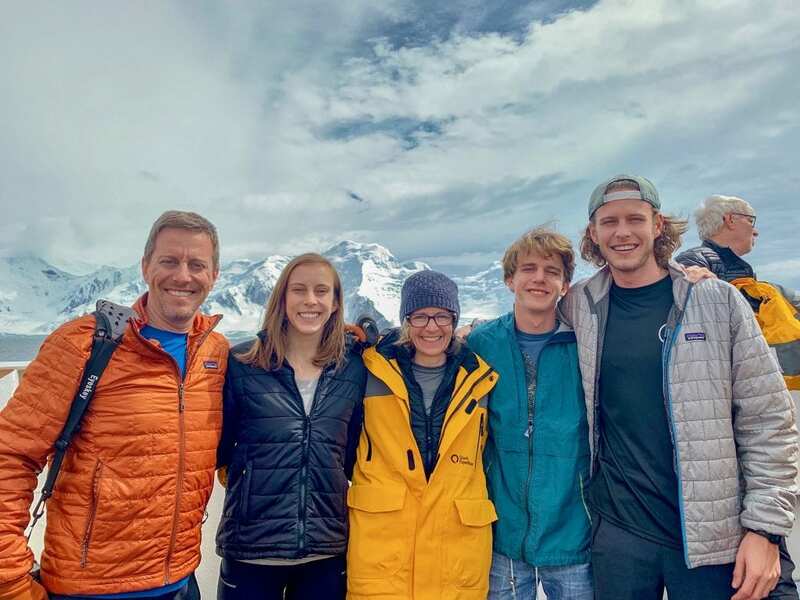 We took a trip to Antarctica during Christmas break going the only way tourists can – via cruise ship. We booked with Quark Expeditions and boarded the Ocean Adventurer with 120 other passengers, a great number. Not too big, but plenty of interesting and well-traveled people to meet. 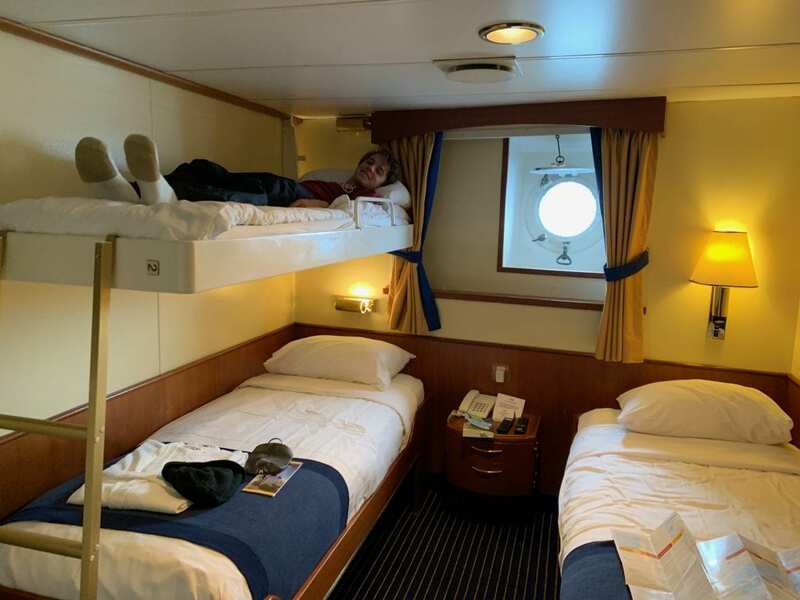 Our family spread out in two cabins on the second deck, one with three beds and one with two. Benji got the top bunk, even though he’s now bigger than Alayna. Old habits die hard. 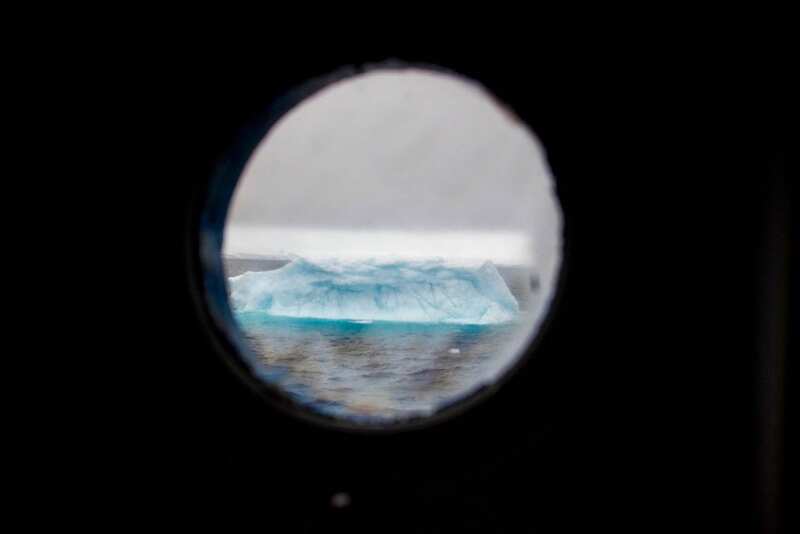 Each of our rooms had one tiny porthole that framed our view of icebergs, islands, and lots and lots of water. One afternoon we got an announcement that there were humpback whales off the bow. We all raced up the stairs and down the narrow walkways to the front of the ship. There was, indeed, a humpback whale. There were lots of them. I found a spot at the rail and admired their shiny black backs cresting out of the water as they ambled along beside us. I heard a gasp from port side and rushed over to hear people on the deck below yelling, “he’s going under the boat!” Back I ran to the right and sure enough, I could see the whole shape of the giant humpback as he passed from beneath. It was so close I could see the bright white of the side fins, and marvel at the size of the blowhole. I could fit inside that blowhole if I fell. I held on tight. The whales stayed with us for quite a while. 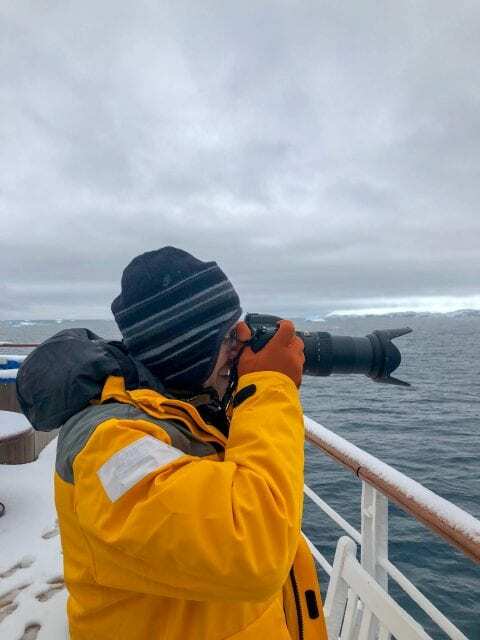 When we got an announcement to go to our cabins and bundle up so we could go out among them in the zodiacs, I was afraid they would leave before we were ready. It takes a while to get 120 passengers loaded into their parkas and hats and gloves and then onto the little black inflatable boats. We raced back to our cabins to add waterproof pants to our long underwear and fleece pant layers, and find all the little bits of winter gear. Clay got his camera, including the waterproof bag he rigged with a Ziploc, just in case. The passengers were divided into five groups, and our group would be last to depart. I glanced out the porthole and noticed a guide in a zodiac floating just outside our room. He was scanning the horizon, and he looked disappointed. I was sure the whales were gone, but then he looked down and started pointing and yelling. A giant black humpback head come up right next to the guide’s zodiac. Clay and I both freaked and ran out of the room with no parka or hat or gloves. The ship decks were almost entirely empty, everyone in their rooms getting ready for the excursion. There were five or six zodiacs in the water, empty except for guides. 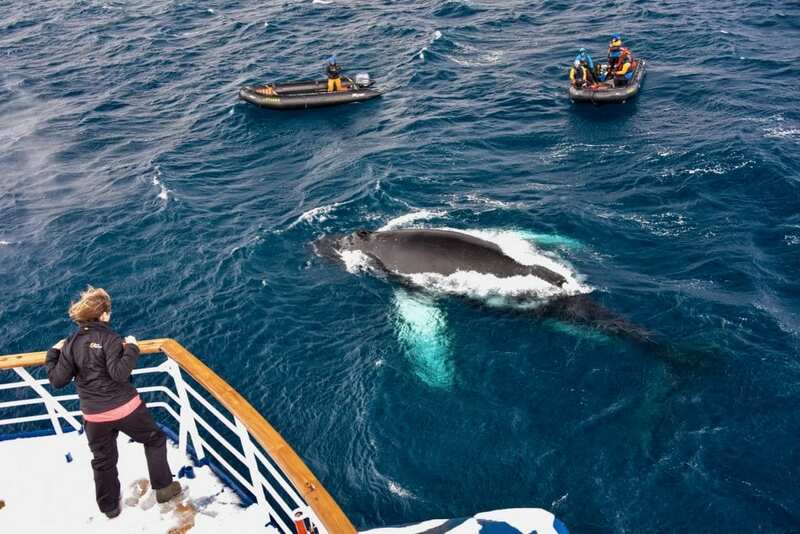 They were waiting for passengers to be loaded, and the humpback was curiously going from boat to boat. He was so close the guides could reach out and touch him. At one point he spouted out of his blowhole and coated one of them in mist. 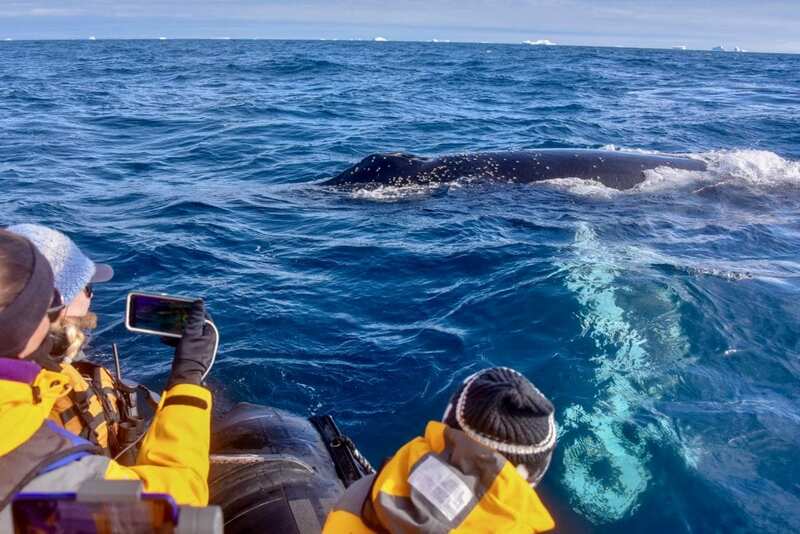 I was jumping and cheering each time the whale came up to them, as if I was at a sporting event and my team was winning. Eventually, the Shackleton Zodiac Group was called to board. We got into our boat and found another curious whale. 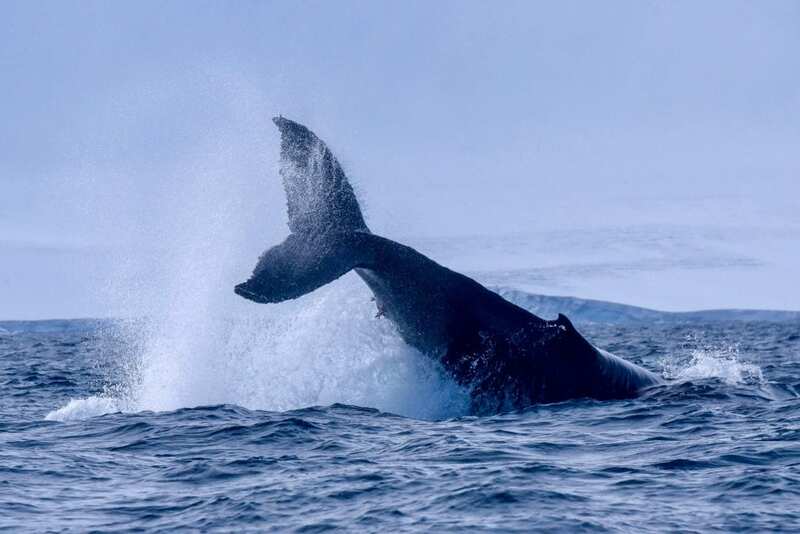 He poked out his head to take a look at us, and splashed the water with his giant back tail fin. He came so close we could see the white barnacles clinging to his back and his white side fin stretched out impossibly long towards us, revealing its massive size. If his side fin was that long, his body was three times longer! He was so close we could smell his fishy smell and hear the breath exhale from his blowhole. 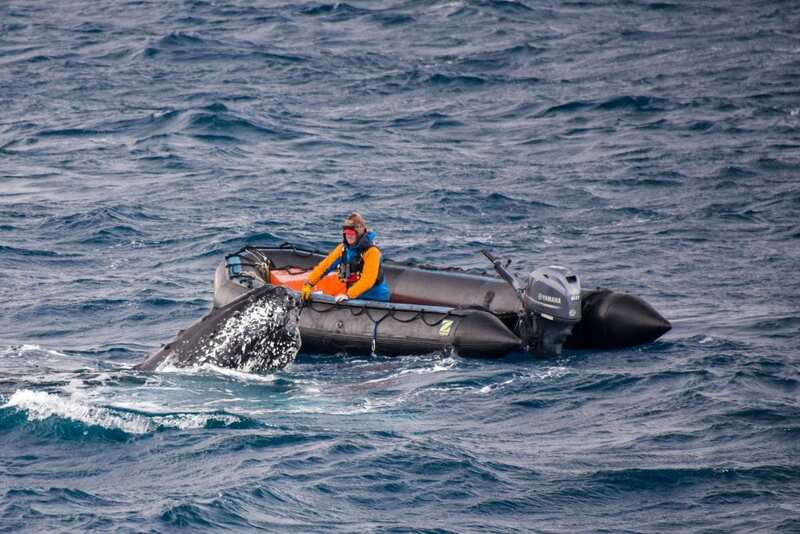 I had no idea when I saw the whale come up under the guide’s boat that we would have the same experience. Even if that’s all I’d seen, that whale encounter framed through the porthole in our room, I’d still be writing this post. It was that cool, and then it was that much cooler. I’ll share a few more Antarctica stories in future posts, and more news about the publication process for HER OWN TWO FEET. This is going to be an exciting year, and we started it off well as we said goodbye to 2018 under the bright Antarctica sky, the sun still shining at midnight.